26th February 2000 - The Wurzels plus disco at St George Labour Club, 32a Church Road, St George, Bristol. Tickets £5.00 from 0117 955 9935. 25th February 2000 - The Wurzels and Fred Wedlock at Bridgwater Town Hall, Bridgwater. Tickets £10.00 in advance. Part of the town's 800th Birthday Celebrations. Cancelled due to unforeseen circumstances! Saturday 13th May 2000 - The Wurzels plus support (noon) at The Cricketers, Bedford Road, Hitchin, Herts. Note the gig is in the afternoon - doors open 12 noon, with the first of the support bands scheduled to start at 2pm. It will take place outside in the garden/car park - standing room only! Tickets now available from the pub priced �10 each. Saturday 10th June 2000 - The Wurzels plus The Woolpackers at Bristol Hippodrome, Bristol (0870 607 7500). Tickets �13.50 and �12.50 (subject to a booking fee of �1.50 if purchased over the phone). 15th June 2000 - The Wurzels at RJ's Bar at Brean Leisure Park, Somerset (01278 751595) Part of the their annual summer season at Brean Leisure Park. Check website for more details, Somerset. 17th June 2000 - The Wurzels at Charity Barndance at Woodhouse Scout Camp Site, Almondsbury, Bristol. 21st June 2000 - The Wurzels at Farmers' Tavern at Brean Leisure Park, Somerset (01278 751595) Part of the their annual summer season at Brean Leisure Park. Check website for more details, Somerset. 6th July 2000 - The Wurzels at RJ's Bar at Brean Leisure Park, Somerset (01278 751595) Part of the their annual summer season at Brean Leisure Park. Check website for more details, Somerset. 12th July 2000 - The Wurzels at Farmers' Tavern at Brean Leisure Park, Somerset (01278 751595) Part of the their annual summer season at Brean Leisure Park. Check website for more details, Somerset. 27th July 2000 - The Wurzels at RJ's Bar at Brean Leisure Park, Somerset (01278 751595) Part of the their annual summer season at Brean Leisure Park. Check website for more details, Somerset. 2nd August 2000 - The Wurzels at Farmers' Tavern at Brean Leisure Park, Somerset (01278 751595) Part of the their annual summer season at Brean Leisure Park. Check website for more details, Somerset. 17th August 2000 - The Wurzels at RJ's Bar at Brean Leisure Park, Somerset (01278 751595) Part of the their annual summer season at Brean Leisure Park. Check website for more details, Somerset. 23rd August 2000 - The Wurzels at Farmers' Tavern at Brean Leisure Park, Somerset (01278 751595) Part of the their annual summer season at Brean Leisure Park. Check website for more details, Somerset. 7th September 2000 - The Wurzels at RJ's Bar at Brean Leisure Park, Somerset (01278 751595) Part of the their annual summer season at Brean Leisure Park. Check website for more details, Somerset. 13th September 2000 - The Wurzels at Farmers' Tavern at Brean Leisure Park, Somerset (01278 751595) Part of the their annual summer season at Brean Leisure Park. Check website for more details, Somerset. 28th September 2000 - The Wurzels at RJ's Bar at Brean Leisure Park, Somerset (01278 751595) Part of the their annual summer season at Brean Leisure Park. Check website for more details, Somerset. Friday 29th September 2000 - The Wurzels plus Sould On Blues (7.30pm) at The Red Lion, Bath Road, Woolverton BA3 Somerset. Tickets are �17.50 (limited numbers). Black tie or smart dress. There will also be a bucking bronco, Matt's Magic and a free hog roast plus a free drink on arrival. For enquiries call Joe or Flo on 01373 831050. Saturday 14th October 2000 - The Wurzels (11am-4pm) celebrate Apple Day at Upper Shaw Community Centre, Great Western Community Forest near Swindon. The day promises to be a "feast of fun for all the family" and includes traditional apple games and workshops for children, specialists to identify your apples from that old tree in your garden, and cider and wine making experts giving demonstrations. The event is totally free. For further details call 01793 466324, or see the Great Western Community Forest website. Thanks to Tommy Banner for telling us about this event! 1st December 2000 - The Wurzels and Pandora's Box Disco (9pm) at the Shrubbery Hotel, Ilminster, Somerset, along with. The event is organised by the Four Seasons Club which is free to join - members can get in for £6.50; non-members pay a quid more - seems worth joining then! Over-21s only. For more details phone 01460 52108. 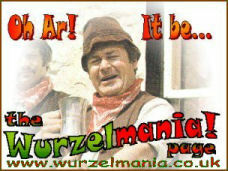 2nd December 2000 - The Wurzels at the The Parish Pump, Worle, Weston-siper-Mare, Somerset. Wurzels' fan Mark "Wilfy" Wilfan was there - he has his own web page www.wilfy.co.uk with loads of pictures of the gig.